Chef Chris Myers began at Madison College. 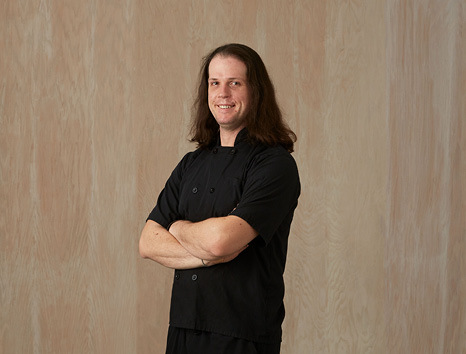 After an externship at the Washington Hotel with Chef Leah Caplan, he moved to New Orleans. Starting at Bayona with Chef Susan Spicer, Chris developed a passion for sauces, charcuterie, and her amazing sweet potato brioche. Offered a Sous Chef position, he helped open Chef Anton Schulte’s Bistro Daisy in Uptown New Orleans. Highlights of his time there include a crawfish ravioli that Food & Wine named one of the 10 Best Restaurant Dishes of 2008. Myers also credits Anton with teaching him a management style based in constant learning and positive feedback. Returning home to Madison, he began with Food Fight Restaurant Group working at Fresco Rooftop Restaurant and Lounge. After five years as Chef de Cuisine and later Executive Chef he made the move to Cento Ristorante, where he currently enjoys both cooking for others, and feeding his own creativity, especially at the Kitchen Table. Myers lives on the east side of Madison and bikes to work year-round. He has two beautiful children with his wife Beth. They take yearly trips to New Orleans to feed their souls and summer trips to Door County to recharge them. You can find Chef Myers on Instagram at @ChefChristopherMyers.